All rates are subject to existing Hawaiian state taxes. (Note: Tax rate is 13.25%) Rates are subject to change without notice. Checkout is by 11 a.m. and guest check in is from 3 p.m. on. Daily maid services are not included with studio units, but are available for an extra fee. We reserve the right to refuse service to anyone. We are not responsible for lost or stolen articles. *No minimum night stay required, however an additional $20 fee is charged for a single night stay. A deposit of 50% is due at the time of booking with the remaining balance due 30 days before arrival. 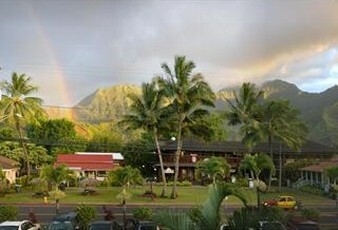 All of our hotel reservations in Hanalei, HI, lasting three days or less require payment in full at time of booking. Payments are accepted by credit card or by check. A confirmation letter with directions and a credit card authorization form (must be faxed, mailed, or e-mailed back to guarantee your reservation) will be sent once the deposit is paid. All cancellations require a 30-day advance notice to receive a room credit (held for one year). Advance hotel reservations are required. For the months of June, July, August, and December a 60-day cancellation notice is required and balance payments are due 60 days before arrival. Room credits are not issued for cancellations less than 30 days before arrival. Refunds are not issued for no-shows or early checkouts. We reserve the right to charge fees for damage, theft, or units left in extremely poor condition. *Specials not combined with any other offer. Contact us in Hanalei, Kauai Hawaii, to find out about our vacation rental availability.